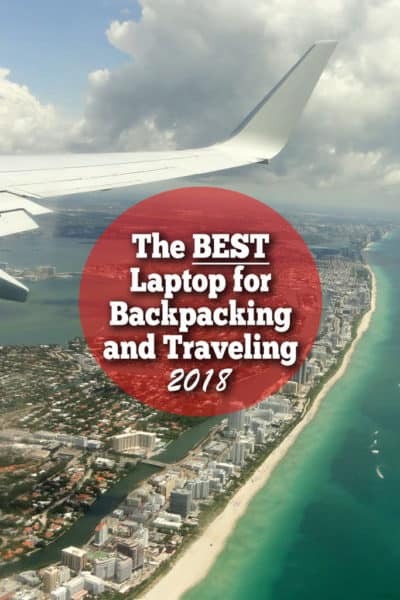 In this article I will be discussing what I would consider the top travel laptops, the new laptop I just picked up to serve as my main travel laptop, which is focused more on performance, as well as another great choice that is a smaller and even more portable laptop, which I used previously but have since gifted to my girlfriend, which now serves as her primary laptop while traveling. But first, more about what I’m looking for when it comes to a great travel laptop, so you will know whether or not we’re on the same page. Parameters for the Best Travel Laptop? My main bread and butter is freelance writing, translating, as well as blogging here on this site, which means I need a computer that it is great for writing as well as fast and adept at both photo editing in Adobe Lightroom and Photoshop, as well as the occasional video editing in Adobe Premiere. I don’t do particularly resource intensive computing or gaming, so that wasn’t a factor in my search for a travel laptop. – Portability, which encompasses both size and more importantly weight. This becomes especially important if you are backpacking or stashing it in your carry-on. Primarily I was looking for a 13” laptop, which offers a good size keyboard and lots of portability. 15” is too big, and something like a 10 or 11” is too small. – Battery life, which is definitely crucial for any traveler if you need to work in airports, on buses, or even at campsites as I often do. Traditional laptops often have a battery life of 3 hours or so, but I wanted something that lasts up to 10 hours and should get me through a full flight or evening of writing. – Storage, this is always an important factor, but I wanted an SSD drive for improved boot speed and program start speed, while planning to supplement with an external hard drive for photos and videos. The above three were my primary factors beyond obvious things like processor, ram, and a brand with a solid reputation. Additionally, I really wanted to ensure that my travel laptop had a matte screen rather than a glass screen which reflects too much light and makes it almost impossible to use in bright environments or outside in natural light, and I wanted back lit keys so I could more easily write at night (like while camping, as mentioned earlier). Of course, the final, and often most important consideration is the price, which can’t be ignored for a travel laptop. 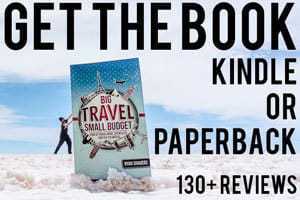 I did NOT want to spend $2,000 on a travel laptop which is often more prone to damage or theft thanks to the life of a traveler. I still remember that one time I had a relatively new Samsung Ultrabook which fell out the back of my truck when I opened the canopy door and landed on the gravel upside down just outside of Lone Pine, California while I was in the middle of a year-long road trip It looked like simple cosmetic damage to the case, but when I turned it on later, the screen was totally scrambled. 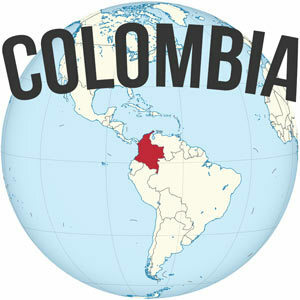 I’m also traveling mostly through Latin America these days, which isn’t exactly a region known for being free of robberies and thefts of valuable tourist goods. When I buy a laptop I expect it to be something that I will use for years to come, so it is a serious purchase that I put a lot of thought into. The aforementioned Samsung laptop lasted me five years (including the screen replacement), so that’s the type of value I’m looking for. The following picks are what I’d recommend to digital nomads, frequent business travelers, or anyone else needing the a great laptop on the go, no matter if they are flying around the world as a backpacker, or road tripping to the end of the world, like me. My criteria basically lead me to ultrabooks, which are high end laptops focusing on power and portability. 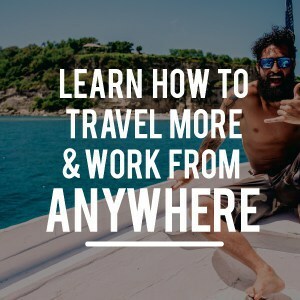 It’s for that reason that ultrabooks are most often the go-to choice for most digital nomads, remote workers, and so forth. Ultrabooks usually weigh under three pounds but still have impressive processors, coupled with long battery life and super fast SSD drives. It’s worth noting that SSD drives are typically smaller than HDD drives, so if you work with large files like RAW photos or Video, then you should get an external hard drive. I travel with two 1TB external hard drives. Apple was the first to put the ultrabooks on the map with the Macbook Air, but those are no longer being updated (it remains virtually the same since 2015), so the Macbook Pro is the next logical choice if you want a new and up-to-date laptop. Unfortunately, Macbook quality and performance hasn’t kept up to Windows 10 ultrabooks in recent years, so they were not under consideration — plus the value for the money is much better spent on a Windows Ultrabook. The Dell XPS looked like a solid laptop, but it was more expensive than the Asus ZenBook and lacked some simple touches like a full-sized SD card (important to me for frequent photo editing as a travel blogger). The Asus ZenBook (UX330UA) is a high quality ultrabook featuring a Core I5 Intel Processor (available in both 7th or 8th gen models, but I got the 7th gen), 8 gigs of ram, and a 256 GB SSD drive. The Asus Zenbook weighs in at 2.6 pounds and features a lightweight but durable aluminum body. The thing is surprisingly thing and light when you’ve actually got it in your hands, and it looks classy and high quality to boot. Best of all it only cost $700, brand new from Amazon. I’d been using my old Samsung Ultrabook recently again while living in Colombia and continued to do so as we started traveling through South America, but it was really starting to show its age, which was what prompted me to get a new laptop. The difference between the two was quite apparent, particularly when it comes to size and weight… But even more so while booting it up. The old Samsung took probably about two minutes until I could use it. The new Asus ZenBook boots up in less than 10 seconds… No exaggeration! The built-in fingerprint reader means I don’t even need to type in a password, so I’m on my desktop within 15 seconds tops. Applications like Evernote or Scrivener launch in a second or two thanks to the super fast SSD drive. Photoshop or Lightroom launch in about 5 seconds. All of this just means less time waiting around and plenty of opportunities to quickly boot up and get work done while you are waiting around, which happens a lot while traveling. I’m loving the speed of this Asus ZenBook and it’s perfect for my type of work. The keyboard feels great as I type, and it’s got the back lit keys that I really wanted, and the brightness is adjustable. There’s nothing really negative to note about it, but the only negative I can really think of is the Power button is where my old Delete key was, so sometimes out of habit I go to hit delete and accidently put the computer into sleep mode. There are also no dedicated Page Up/Down and Home/End keys, meaning you have to hit function and the arrow keys. Battery life has been outstanding on the new ZenBook, with approximately 10 hours of battery life, while I haven’t taken any long flights as of the time of writing, I’ve been using the laptop many days without connecting it and it lasts me basically the entire work day, which is what I was looking for. The charger is nice, although the bulky power box or whatever it’s called, sits at the point of connection to the power outlet, which isn’t my favorite, as It can be tricky at times to connect to the wall. The cord is plenty long though, but I still always travel with a small extension cable as before. The Asus ZenBook also offers a full-sized SD card drive (something that turned me off the aforementioned Dell XPS), which is important for me to be able to download my photos, rather than having to connect dongles and adapters. It has two USB ports, which is what I need to connect a mouse and one external hard drive, so that’s perfect. The main downside is the 256 GB SSD Hard Drive. I love the speed, but it’s tough to adjust to a smaller drive. My five-year old Samsung which I was using most recently had a 750 GB. To get around this I do not save any photos (since they are large RAW files) or videos to the hard drive, but work off an external hard drive. I’ve also since moved into the cloud with a 1TB cloud drive with Microsoft OneDrive. This is something I’ve been thinking about for a while, particularly to act as security to back up my many, many travel photos, and important work projects. OneDrive is only $70 per year for 1TB and it also includes Microsoft Office, of which Word is important for my freelance writing business in order to send files, so it was a no-brainer. Other services like Dropbox or Google Drive offer 1TB for $100 per year. OneDrive integrates well with Windows 10 because you can individually select which folders you want available for offline access, easily copy and move things in Windows Explorer, etc. All in all, I’ve been very impressed with the Asus ZenBook and while it’s always expensive to buy a new computer, this one wasn’t shockingly so, at only $700. I’m definitely happy with my purchase, and would consider this to be the best travel laptop which will serve me for 2018 and well beyond, I hope. It combines the speed, portability, battery life, and ultimately the price point that was the best. I stumbled across the ASUS T-100 Transformer not long before my departure to Cartagena, Colombia. 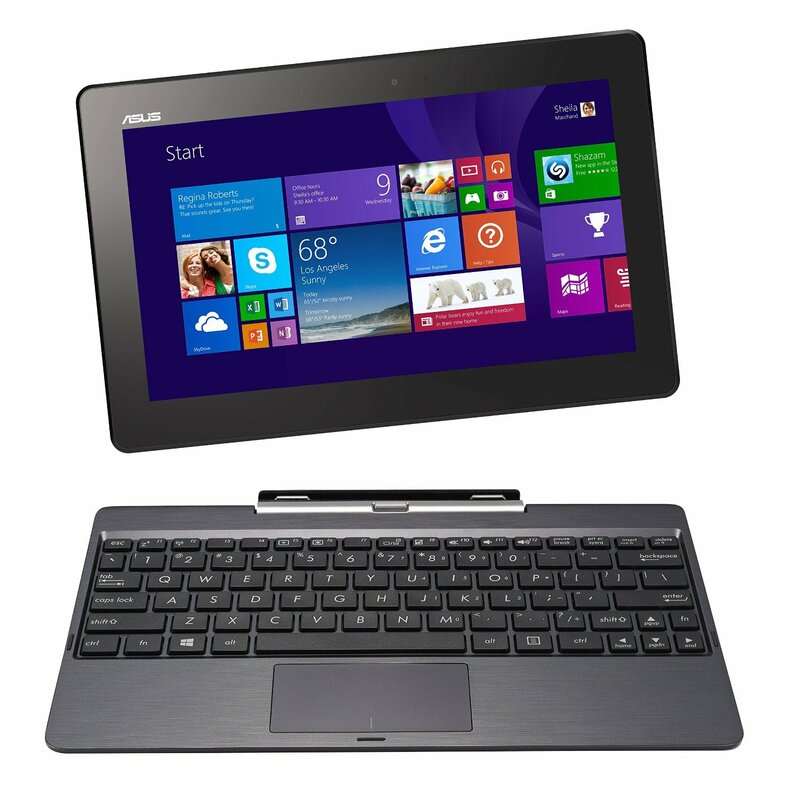 The ASUS Transformer is so named because it is a half tablet, half laptop style design–where the screen can actually detach from the keyboard to be used as a tablet. Spec-wise, the T-100 features a 10.1″ touch screen display, 2GB of RAM, 64GB solid state hard drive, and a 1.33Ghz Intel Atom processor. Unlike other tablets, it features a full installation of Windows 8, which means you can run all your normal programs. It also retails for under $400. While this laptop is by no means a powerhouse, it is more than capable of doing everything I ask it to… Primarily surfing the web, blogging, photo editing and video editing. More on that in a minute. I’ve been using the ASUS Transformer for more than a year and I can state unequivocally that I am very glad that I made this travel laptop purchase. First and foremost this laptop is meant to be portable and light. That is why I bought it and that is the major selling point. The laptop, charger, and padded case weigh in at 2 lbs, 14 oz. A nearly 50% weight savings versus my previous laptop as well as a significant reduction in size/volume in my pack, and this is, simply put, among the best lightweight laptops out there. This is a big deal. You can run all the programs you are used to having with the full and normal interface, and are not restricted to apps from the Google Play store or something of that nature. I can run the full Photoshop CC, Lightroom, Evernote, Picasa, iTunes and all the other programs that I have become accustomed to. Unlike a traditional laptop, it does not have a proprietary battery charger, but rather features a standard micro-USB charger. This is great for a few reasons: namely it is way lighter and less bulky, you can share chargers between your camera, cellphone, etc, and if you ever lose it, it is very easily replaced. 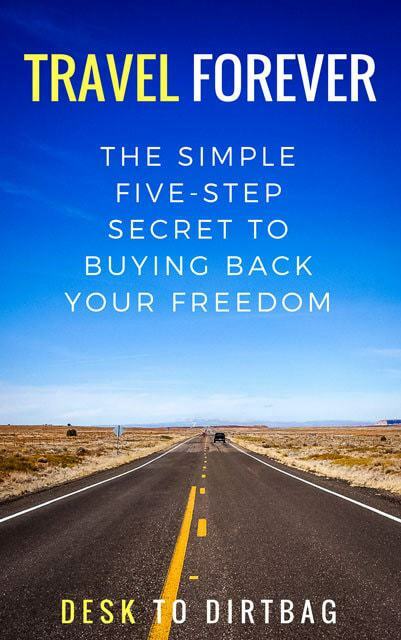 This was another major selling point for me considering I planned to spend lots of time away from power sources: camping, volunteering on farms, and those dreaded 8+ hour bus rides through the Colombian countryside. The laptop features an 11 hour battery life, which is quite incredible. I can use the thing all day long and not have to worry about it dying. It also means I can take notes about my travels, draft blog articles, watch numerous movies, and whatever else, all while camping out in the countryside or winding and weaving down these roads in a bus. Obviously, unlike other normal tablets, you’ve got a real keyboard to work with! If you plan to do much writing, whether that’s emails, blog posts, or other things, a keyboard is a must. To be sure, the keyboard is small–the same 10.1″ size–so you will have to get used to it. After the initial period of acclimation, my fingers have adapted and I can type just as well on this thing as I did before. The hard drive is only 64GB, so you are quite limited with what you can install and how many photos/videos you can work with at any given time. It does feature a Micro SD expansion slot which you could store, movies, photos, and files on. I got around the small hard drive size by bringing along a 1TB My Passport external hard drive. I keep all my movies, archived photos, and larger, less-frequently used software (like Photoshop CC or Premiere Elements CC) on the external hard drive or SD Card. You can run software or watch movies directly off the external hard drive, and yes, it is powerful enough to run Photoshop or Premiere, amazingly. In a way though, I also think that having the external hard drive can be a plus. At the least, if you keep your laptop and hard drive stored in different areas (say, one in your daypack on the bus, the other stashed in your main pack in the storage compartment, or one in the locker at the hostel, the other in your pack), and someone DOES steal your laptop, you’ve still got the majority of your photos and files stored on the external hard drive. As you can read in the numerous Amazon.com reviews of this product, the integrated touch pad isn’t the best. It can be finicky and annoying. I had planned to bring along a mini USB-travel mouse regardless, so it doesn’t bother me too often. When I do have to use it, it isn’t terrible, it just isn’t the smoothest and most responsive out there. There is only one USB port! It would make a huge difference for me to just have two USB ports. That way I could plug in my external hard drive and USB mouse at the same time. Before, when I used to run Photoshop off of my external hard drive, I had to use the aforementioned lackluster touch pad. Eventually I wised up and installed programs like these on my SD Card so I can continue to use the USB port for my mouse. There are a few minor annoyances that I figured I should mention as well. For instance, when the battery is fully drained, you can’t just plug it in and turn it on as you would a normal laptop, it takes a few minutes to charge before it can even be turned on. It is also somewhat top heavy (the screen), which has scared me a few times when I’ve almost tipped it over backwards in the direction of the ground below (like toward the edge of the bed). Still hasn’t taken a fall though. I haven’t had any problems or faults to report. Now the left hand side of my touch screen no longer works, while the right half continues to work just fine. Honestly, I never really use the touch screen though. I’m just happy that my laptop continues to function and that the crack hasn’t caused any ongoing problems. 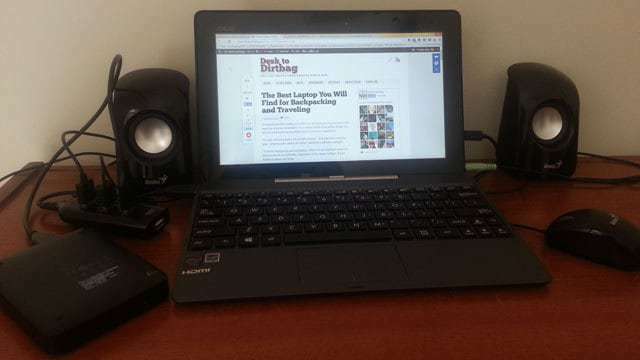 My ASUS T100 Transformer and the accessories I have added since settling down in Medellin, Colombia. I think the ASUS T-100 Transformer is a great lightweight travel laptop–it was absolutely exactly what I was looking for–and offers up a great value for less than $400 retail. If you are looking for a lightweight, portable, and highly functional travel laptop, especially for backpackers, I think you’d be pretty hard pressed to find something better than the ASUS T-100 Transformer. So there you have it, I think ASUS is making some of the best travel laptops out there, not only are there a number that are portable and powerful, but also relatively affordable. If you are looking for a standard size laptop which is best for writing, and is more powerful, then you can’t go wrong with the ASUS ZenBook. It is perfect for people who need a great daily laptop and one that will continue to serve as a general use laptop for years to come. But if you are looking for something smaller, more portable, and more specialized, then the ASUS Transformer is another great choice. I used it as my main laptop while backpacking through Colombia for about one year, and it continues to work great. How do you balance the competing demands of electronics between portability and performance? Especially as it relates to cameras and computers… Sound off in the comments below! 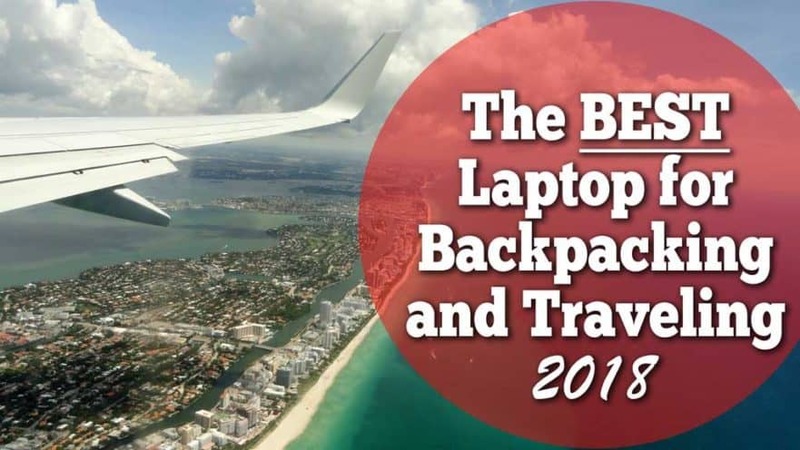 Did you enjoy this post about the best travel laptop? Then give it a quick share on Pinterest, Facebook, or Twitter. Thanks! I’ve finally come to grips with the Cloud and that choosing a smaller, lighter laptop with a smaller hard drive is ok. I’m always on the move and simply want lighter. Also have a T100, and with a micro usb to female full usb adapter you get two normal usb ports. This lets me connect two external hard drives and back files up from one to the other, game changer as a photographer! I have heard some T100 models don’t have the micro usb port. Also while doing this I can’t charge it AND powering two external drives off this thing drains the battery crazy fast. I just bought a Macbook Air a couple months ago and they are still being sold on Apple’s website. Where did you hear they are no longer being produced? O wow! this is a nice recommendation….. I had bought ASUS but it had several issues within one year of purchase :/ Do you endorse them? Still using that same laptop, even with the cracked screen. It’s been good for these past three years, though the battery life has taken a hit. Awesome post! It is certainly nice to have a real keyboard and for it to be as lightweight as possible. Thanks for sharing! Finding the right laptop for traveling is very important. You want something lightweight that still has the features and performance you need. Thanks for sharing. Great list of laptops. For me a travel laptop needs to be light and have a battery that lasts a while. Thanks for sharing! Just discovered this blog and I love it! After extensive research I also chose the Asus T100 for my 3 month trip to East Africa and couldn’t have been happier. I made sure to to get the 2 year accidental damage warranty which was an added cost – I think about $80 – but SO worth it in the long run. Mine really took a beating in the dust department which affected the keyboard and touchpad, and I also dropped it once so it had a couple nice dents as well, all of which Asus took care of when I sent it in upon returning to the states. I’m thinking for my next trip I’ll want to invest in a DSLR camera along the same lines of cheap/light/good enough quality. Any thoughts there? Awesome! Glad to hear it has held up well for you while traveling as well. It’s a really great little laptop, I think. Should have probably got the extra warranty as well–the screen glass has cracked in a few different places now and the touchscreen is unusable. As for a good camera… I really like my Sony NEX-6 (or the Sony NEX series in general). It isn’t a DSLR, but a mirrorless camera. It has all the functionality of a high end dslr, and a wide selection of lenses (including adapters to use Nikon, Canon, etc if you like). Best of all with a mirrorless camera is they are much smaller and more portable than a DSLR, and don’t attract as much unwanted attention while traveling (screaming big expensive camera). I’ve been using mine for three years or so, and it has held up like a champ. You’ll have to send it in for a sensor cleaning every once and awhile though, if you’re traveling through harsh areas like me. Oh boy, you helped someone who was confused today! Digital hugs! I gave this plenty of thought when I was choosing a netbook to take travelling with us, but those cons really dug into me. Eventually I took a netbook for the first 18 months, but as soon as I could I upgraded and got my old laptop back to travel with and now I’m soooooper happy. As you remarked, it all depends on your needs. Check prices, convenience of weight, etc; but above all make sure it’s going to cope with what you’re throwing at it. That is definitely the key thing. Identify what you need it for first and foremost (photos, writing, video editing, surfing the net) and what your biggest priority is (size, weight, features, hard drive space), etc… Then try and find the best deal that meets your criteria. There are a lot of different devices to choose from!